Approaches for forecasting future supply problems that start from the amount of resources in the ground suffer from the problem that it is hard to draw a sharp line regarding when we will run into difficulties. It is clear that at some point, there will be a problem–EROEI (Energy Return on Energy Investment) will be too low–but exactly whenis hard to pinpoint. If a person starts from an optimistic viewpoint, it is easy to assume that as long as Energy Output is greater than Energy Input for a given process, that process must be helpful for solving our energy problem. In fact, in my opinion, the story is very different. The very thing that should be saving us–technology–has side effects that bring the whole system down. The only way we can keep adding technology is by adding more capital goods, more specialization, and more advanced education for selected members of society. The problem, as we should know from research regarding historical economies that have collapsed, is that more complexity ultimately leads to collapse because it leads to huge wage disparity. (See Tainter; Turchin and Nefedov.) Ultimately, the people at the bottom of the hierarchy cannot afford the output of the economy. Added debt at lower interest rates can only partially offset this problem. Governments cannot collect enough taxes from the large number of people at the bottom of the hierarchy, even though the top 1% may flourish. The economy tends to collapse because of the side effects of greater complexity. 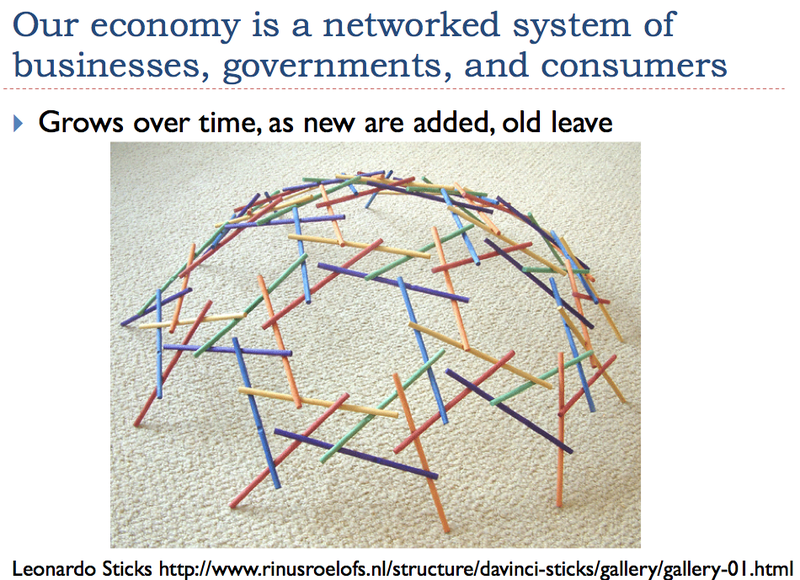 Our economy is a networked system, so it should not be surprising that there is more than one way for the system to reach its end. 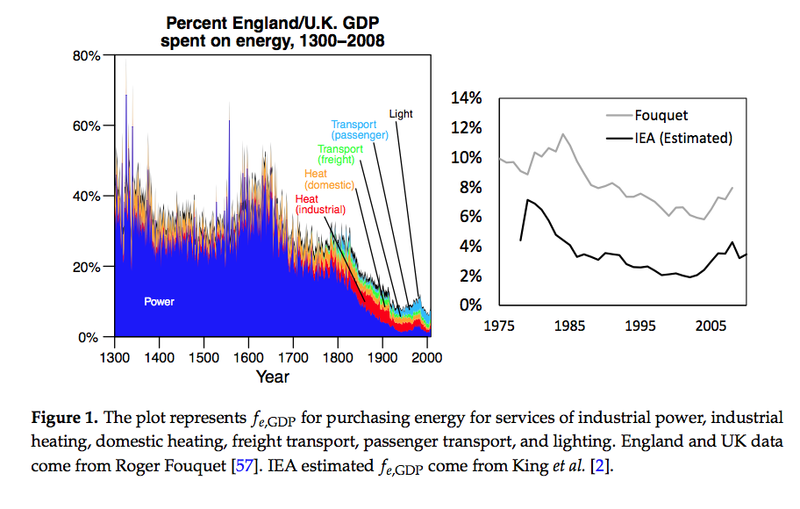 While what I call “fossil fuel EROEI” was a reasonable starting place for an analysis of our energy problems back in the 1970s, the calculation now gets more emphasis than it truly deserves. The limit we are reaching is a different one: falling return on human labor EROEI, at least for those who are not among the elite. Increasing wage disparity is becoming a severe problem now; it is the reason we have very divisive candidates running for political office, and many people in favor of reduced globalization. If a system has multiple parts to it, as is the case with the system that controls energy extraction and energy prices, it is likely that a fairly complex model is needed to make a model that really represents the situation. The earliest models were in a sense one dimensional, when they needed to be multi-dimensional. With these additional dimensions, the model would include such characteristics as the fact that demand is controlled by a financial system, and the fact that the level of demand (and thus prices) depends on the ability of even the lowest-paid workers to afford the output of the system. The model could also include what is essentially a physics problem–if there is not enough energy to go around, the usual solution is “more technology” or “more complexity.” What more technology and more complexity add is more concentrations of energy in various ways: in capital goods such as machinery and vehicles, in larger businesses to own these devices, in high-paid management officials, and in workers with specialized training. These concentrations of energy are what lead to wealth disparity–some people “own” businesses and capital goods, and some people (but not others) receive advanced education or other specialized training. All of these things allow a relatively small number of privileged people to receive a greater share of the output of the economy. This leaves less for the rest. As the result of this wage disparity, the economy ends up with too many people either dropping out of the work force, or earning low wages. It is lack of the ability of these people to afford the output of the economy that brings the economy down. 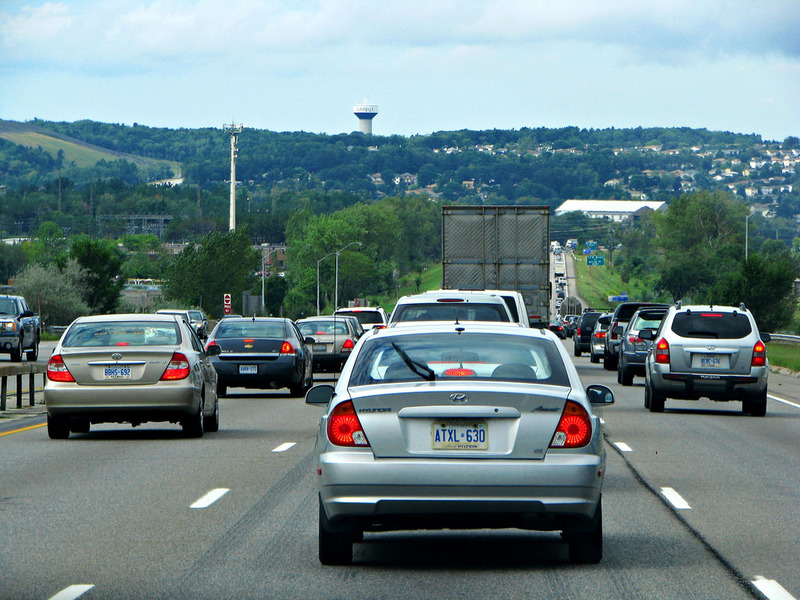 Demand is closely related to affordability of goods made using fossil fuels, such as homes and cars. Many people miss the connection between demand and affordability. Of course, if we didn’t have this falling demand problem (or low price problem) caused by increased concentrations of wealth leaving too large a share of the population too poor, we would eventually get to something similar to the problem that many have been concerned about: fossil fuel EROEI would eventually fall too low. When talking about resource limits, the thing that tends to confuse most people is the large quantity of energy resources that seems to be available. We can get some of these resources out with today’s technology. Logic would seem to suggest that with improved technology, we should be able to keep moving on to increasingly difficult-to-extract fossil fuel resources. We should also be able to create increasing quantities of substitutes. M. King Hubbert gave an answer that only went partway in telling the extent of our problems. Basically, he said that once we had extracted 50% of a particular resource, the quantity we could extract would tend to decline in a more or less symmetric curve. Figure 2. 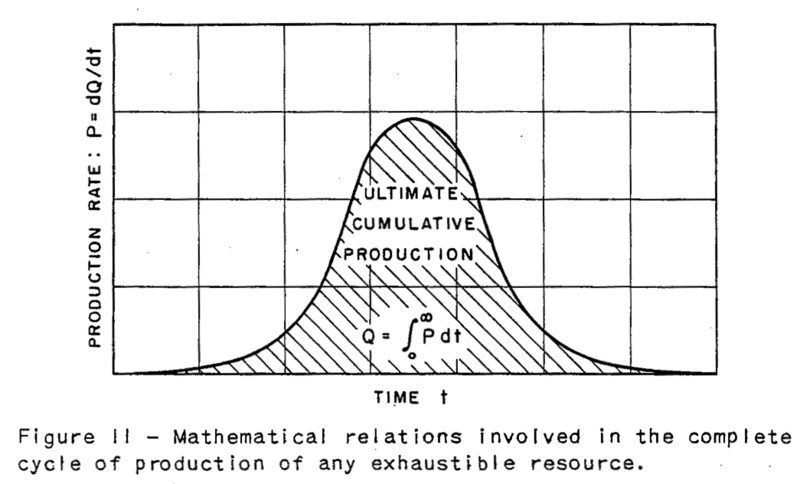 M. King Hubbert’s indicated symmetric curve of resource extraction from Nuclear Energy and the Fossil Fuels, published in 1956. Hubbert described the situation of a single well or field, when there were other wells or fields taking the place of the wells and fields depleting. In this situation, demand (and thus price) stays pretty much the same. If investment in the well remains the same, production will tend to follow a symmetric curve. Low demand. We have wages that show increasing disparity. Wealthy people tend to spend their incomes on goods that are not very energy-intensive, such as education and financial services, while less wealthy people tend to spend a larger share of their incomes on energy-intensive products such as food, basic transportation, and basic housing. Thus, this shift in wage patterns tends to reduce energy demand, and thus energy prices. Government attempts to fix low demand. Low demand leads to low economic growth, so governments and central banks are doing everything that they can to raise demand. Their approaches include ultra-low interest rates and deficit spending. The hope is that even if citizens don’t have sufficient wages to buy expensive goods such as cars and homes, the additional debt at low interest rates will make these goods, more affordable and thus spur demand. We can keep increasing oil and other fossil fuel extraction, as long as our current system continues to “work.” In particular, prices need to be high enough for those extracting oil to make a reasonable profit, to cover reinvestment needs. The profit has to be high enough, too, so that the companies can pay taxes to their governments, so that governments can continue programs that mostly benefit the 99% of the citizens who don’t have high incomes. This is a major way that the net energy that is generated by fossil fuels gets back to benefit the government and the many poorer citizens who benefit from government programs. Neither Peak Oilers nor The Powers That Be (TPTB) figured out the real story. The Peak Oilers were “tripped up” by the overly simple model problem I described above. They assumed that 50% of remaining fossil fuels could be extracted after peak, regardless of whatever other circumstances might hold. Economists provided one part of this overly simple model: they postulated that if there were a shortage of some product, prices would rise. This view is true when there is not too much wage disparity, but it is not true in general. The combination of these overly simple assumptions leads to the belief that we can continue to pump quite a lot of fossil fuels, even after the decline begins. These remaining fossil fuels together with renewables can lead to some sort of civilization at a lower level after collapse. High prices will point the way to economizing. TPTB were even more confused. They listened only to economists, with their overly simple model about future prices, and paid no attention to Hubbert and his message that extraction would become more difficult after 50% of a given resource was extracted. Instead, they assumed that the recent pattern of adding new extraction at ever-higher cost would continue indefinitely, as a result of improved technology. Prices would probably rise moderately, as well. Figure 3. 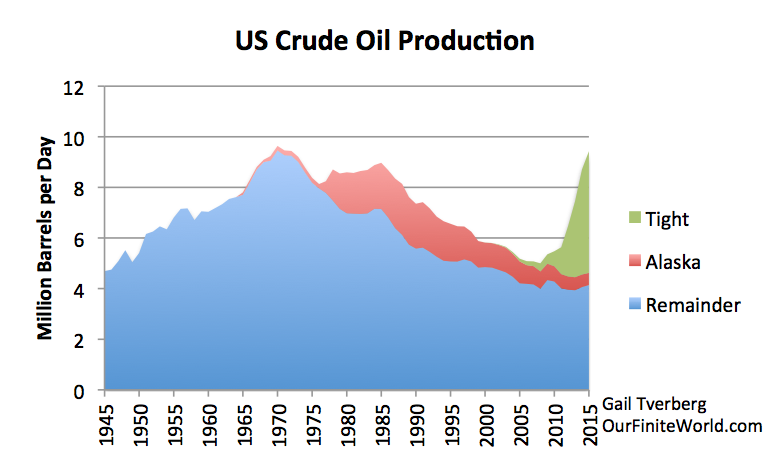 Figure from Jeremy Grantham article published on The Oil Drum in 2011. Figure 4. US crude oil production, separated into tight oil (from shale formations), oil from Alaska, and other oil, based on EIA data. If there is an increasing wage disparity problem, the whole idea of ever-rising prices because of more technology doesn’t really work. At some point, there is an affordability problem, leading to low prices rather than high prices. Ever more debt at lower interest rates cannot cover up a problem of stagnating wages for the masses. What Does Falling Fossil Fuel EROEI Tell Us? Quite a few commenters on OurFiniteWorld.com like to use “falling EROEI” as a synonym for “reaching diminishing returns.” EROEI (really “fossil fuel EROEI”) as developed by Energy Researcher Charles Hall, is calculated by dividing “Energy Produced” by “Fossil Fuel Energy Used to Deliver that Energy.” The easiest-to-extract oil or coal or natural gas tends to be extracted first, and the later-to-be-produced fuel tends to have lower EROEI. Thus, lower EROEI is a handy numerical way of quantifying diminishing returns with respect to the production of energy using fossil fuel inputs. We quickly get to a paradox: if falling EROEI is raising the cost of extraction for all fossil fuels, are we using an increasing share of the output of the economy for energy production? The answer for historical periods has been, “No.” Energy Researcher Carey King has reported on this in an academic paper. Figure 5. Figure by Carey King from “Comparing World Economic and Net Energy Metrics Part 3: Macroeconomic Historical and Future Perspectives,” published in Energies in Nov. 2015. Figure 6. 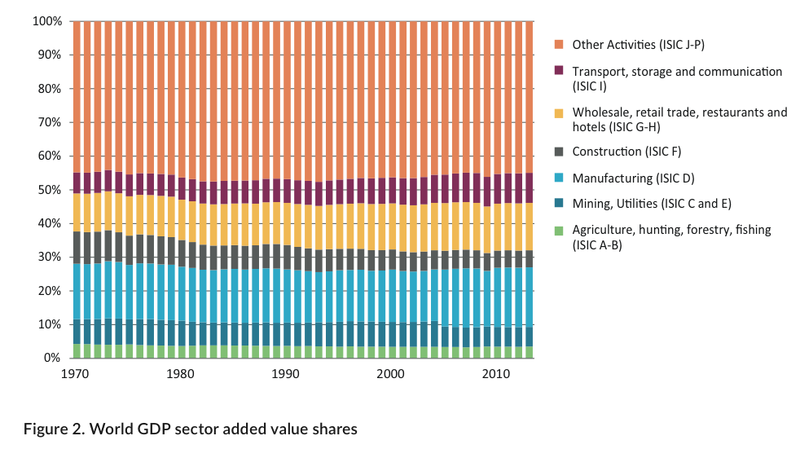 Figure from UNEP Global Material Flows and Resource Productivity. Figure 6 shows that the bottom two sectors, namely “Agriculture, hunting, forestry, fishing,” and “Mining and utilities” continue to fall to lower levels as a percentage of the world economy, through the last year shown, 2013. The way that these falling percentages seem to take place is through rebalancing of energy supply toward countries with a lower-cost energy mix. See the Appendix for more information on how this seems to occur. Aude Illig and Ian Schindler, who are specialists in mathematics and economics working at the Toulouse School of Economics, have been examining how oil prices can be expected to behave, both before and after the share of the world’s resources devoted to energy extraction hits the low point (nadir) and begins rising again, if Figures 5 and 6 were extended forward. They explain their findings in a working paper called Oil Extraction and Price Dynamics. It shows that prior to the nadir, oil prices can be expected to generally rise, with some temporary spikes. Once we are past the nadir, the dynamics are the opposite. Prices tend to fall, exacerbating the decline. 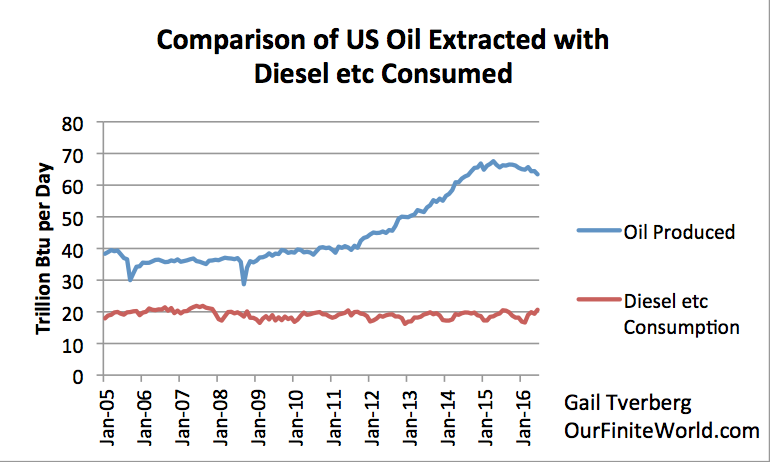 Does US Drilling for Oil Add to US Industrial Energy Consumption? One of the commenters on OurFiniteWorld.com recently asked what impact the rise and fall of US oil production would have on US energy consumption. 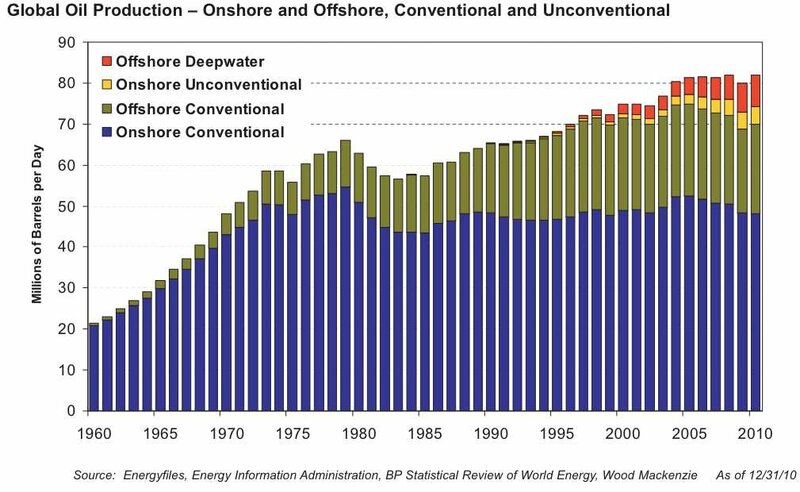 In his view, if extraction of oil from shale has low EROEI, surely US industrial consumption of oil or of total energy must rise and fall in response to the greater production. When we looked, any impact seemed to be too small to measure (Figure 7). Figure 7. 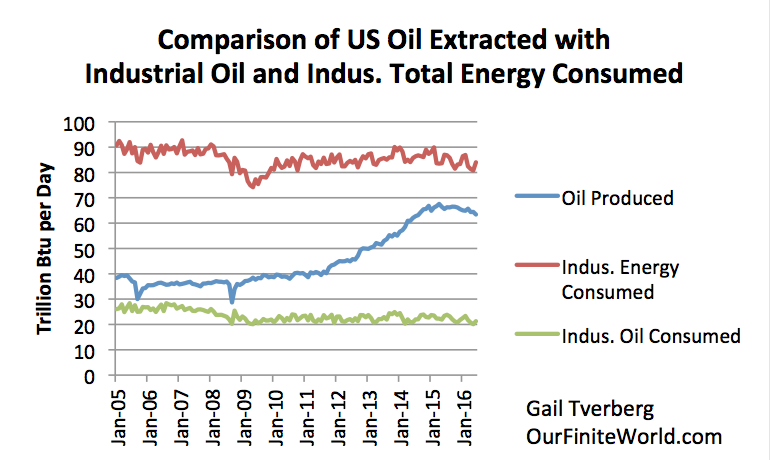 Comparison of US oil extraction with industrial consumption of total energy and of oil by itself, based on EIA data (monthly amounts, converted to average daily amounts). Transportation energy is not included in industrial energy, so we looked at diesel energy consumption, to see whether it had changed materially in response to all of the drilling activity. Again, it was hard to discern any impact (Figure 8). 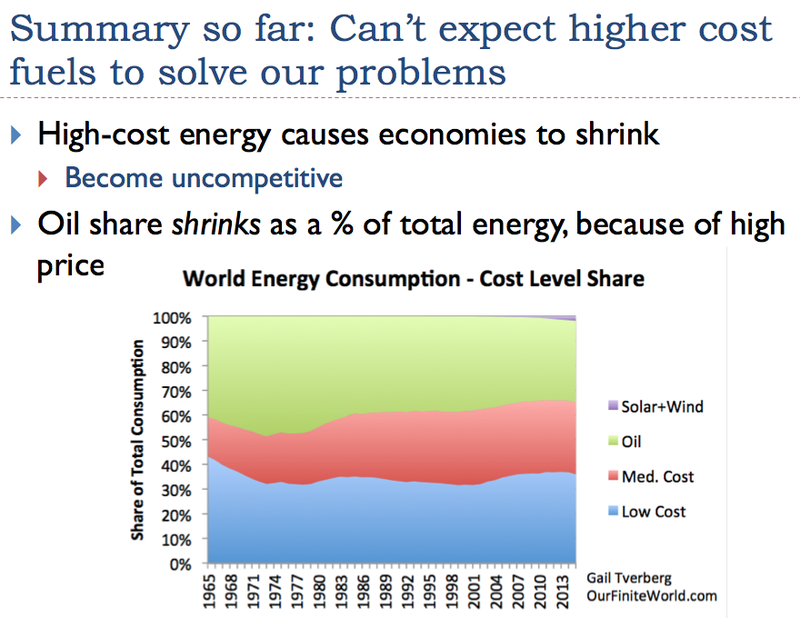 Thinking about the situation, the energy consumed is quite possibly not consumed in the US. For example, a great deal of steel pipeline will be used. This pipeline could be made with coal and imported from China. The timing could vary as well, if the pipeline and the machines drilling the wells were made some time in advance. Some natural gas or oil is no doubt burned when wells are drilled, but, in the whole scheme of things, the amount isn’t large enough to cause even a tiny hump in the data. If we think about the situation, it is not really the “energy consumed” (and thus EROEI) that affects “demand.” Instead, it is the selling price of the oil that affects demand for energy products. This selling price of oil is shared many ways. This selling price includes not only the direct cost of energy used in extraction, but many other costs, as well: wages, leases, dividends, royalties and taxes of various sorts. In many cases, the royalties and taxes go to provide benefits for the non-elite–in other words, the 99%. The selling price acts as stimulus for the entire world economy, not just the part related to EROEI. If the price of oil drops, what tends to be cut first is taxes–the money that goes to help the non-elite 99% of the economy. Besides taxes, wages and pension benefits tend to be cut very early, in an attempt to keep the company operating. These comprise a large share of costs, so are easy to cut. Strange as it may seem, oil extraction may not be cut back, even in bankruptcy. Creditors want as much value to be retained as possible after bankruptcy. So What Does EROEI Tell Us? EROEI as a way of allocating limited fossil fuel energy supplies. One way of thinking about EROEI is that it can be used to show the optimal way of stretching a given supply of fossil fuels; all a person needs to do is select new approaches for producing energy products with the highest EROEI values, to be able to leverage available fossil fuels as much as possible. The EROEI calculation seems to be oriented in the direction of allocating scarce resources. Energy is counted using its Btu value. Thus, oil is viewed as having the same “value” as coal (based on its Btu content), and intermittent electricity is viewed as having the same value as electricity that is suitable for distribution to customers. Since the focus is on fossil fuels “running out,” some researchers leave out hydroelectric power from EROEI calculations; it does not represent the use of fossil fuel energy. Human labor is generally left out, as are taxes, interest payments, lease payments, and many other components of costs. “Boundaries” on what energy inputs are to be included vary considerably from researcher to researcher, making comparisons among analyses difficult. For example, is energy used in the irrigation of biofuel crops included in calculations? Reports prepared by researchers from certain universities tend to give higher EROEIs than those from other universities. There is sometimes a suspicion that the funding source for a particular university biases the results of its EROEI calculations. This situation is not too different from the independence problems experienced in other types of academic studies. Back door to estimating costs. EROEI can also be considered as a backdoor approach for estimating the approximate cost of extraction. Researchers working in a university are unlikely to be able to obtain information on the true total cost of extraction. On the other hand, if they can develop a new metric, they have the possibility of building a tool that they can keep updating with company information. There seems to have been early hope that the new metric would be more objective than other available cost information. Doesn’t behave like the cost metric we are used to. There often is an economic reason to make a highly valued liquid fuel from less valuable coal or natural gas, but the calculation does not take this into account. This is one reason that the EROEIs for ethanol tend to be very low; ethanol production tends to use quite a bit of electricity from coal or natural gas to produce somewhat higher-valued ethanol. Another catch in trying to use EROEI for comparison purposes is that EROEIs for capital goods (such as wind and solar) behave differently from EROEIs of fuels that are burned. With capital goods, society first “digs an EROEI hole,” and over time, must dig itself out. (I expect that this is one of the reasons for our debt problem.) 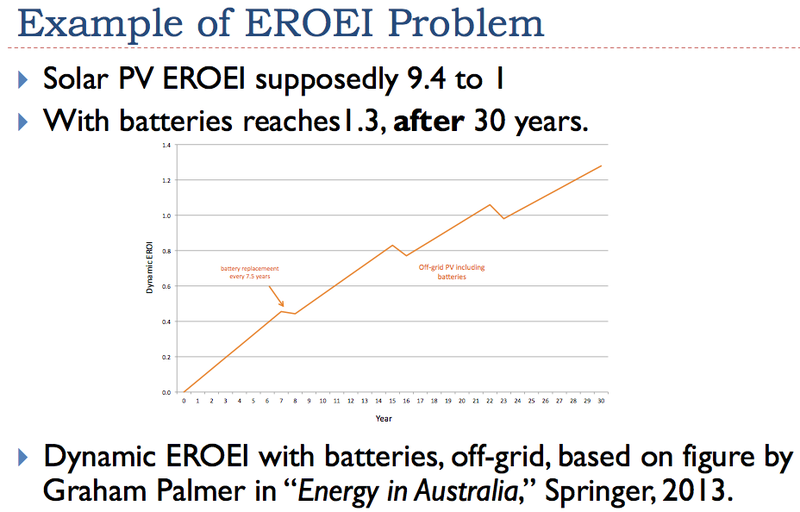 Energy Researcher Graham Palmer has developed “Dynamic EROEI” to deal with this problem. Wind and solar have a second problem, besides the use of capital goods problem, and that is an intermittency problem that is difficult for the grid to correct, especially when more than a small amount is added to the grid. In Figure 9, Graham Palmer has added batteries, and replaced them three times during the 30-year lifetime of the solar panels, to correct the intermittency problem. I would argue that other costs should also be included–the cost of building and operating an inverter and replacement inverter(s), for example, plus any type of installation costs. Interest costs are not typically included in EROEI calculations, but it would seem like they should be, whenever the delivery of energy is substantially delayed, as it is when some type of capital good is used to capture energy from the sun. Alternatively, instead of adding battery costs, it would theoretically be possible to revise the calculation to include the energy cost of adjusting the electric grid to handle the intermittency. All of these issues have to do with selecting proper “boundaries” for the calculation. Something that we don’t often think about is that individual types of energy production can be evaluated from the point of view of the extent to which they provide funding for the 99%, versus funding for the elite 1%. EROEI, of course, cannot consider this at all. Fossil fuels would seem to favor the 99% because the fossil fuel industry has traditionally has been heavy payers of taxes. These taxes go to help the vast majority. It is rare to find reports showing taxes paid by fossil fuel producers, however. Instead, reports tend to show subsidies, which are offsets to the high tax payments. These offsets are frequently payments for such purposes as helping low income people pay their winter heating bills. While these payments are called “subsidies,” in a true sense they are often ways of helping the 99%. 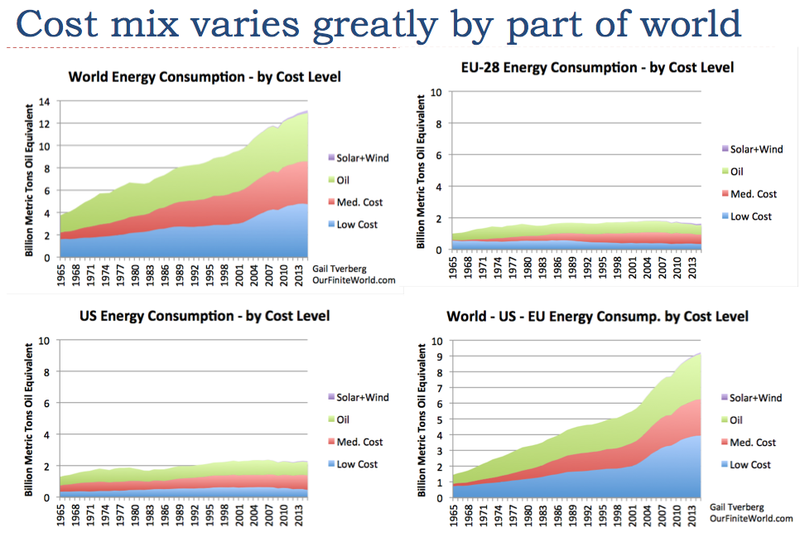 Wind and solar tend to be financed in the US with tax credits. These tax credits help concentrate wealth among the already wealthy. In Europe, the high cost of intermittent renewables tends to be paid by individual households. This leads to a situation where businesses, and the owners and operators of these businesses, benefit at the expense of those who are financially less well off. The debt level with wind and solar (and all of their related paraphernalia that often gets left out of EROEI calculations) also tends to be high. Interest on this debt transfers money from the 99% to the 1%. The grid likely will need upgrading to handle intermittent renewables. This cost, too, will be borne by the 99% through higher electricity rates or higher taxes. What Should the Role of EROEI Be? EROEI is now well established as a tool to try to see how much energy is being consumed in making an energy product. I think that many people have expectations for EROEI beyond what it really can do. For example, I don’t think that EROEI calculations can predict when the economy will collapse, because the mechanics for reaching collapse come from a different direction–namely, increasing wage disparity and low commodity prices. EROEI doesn’t consider whether a high-valued product is being used to produce a low-valued product, or vice versa. The solution here is to look at the actual cost involved in producing the energy product, as a supplement to EROEI calculations. This is important if our real energy problem is high cost and lack of affordability, rather than “running out” of fossil fuels. EROEI calculations also are not designed to look at the required growth in debt, and the required transfer of wealth from the 99% to the 1%. Clearly, it would be helpful to add some new tools to the tool set, to look at these problems. As a check on whether EROEI calculations are really producing reasonable results, any energy product that is producing net energy should be able to support the government with taxes, rather than being dependent on subsidies. If an energy product is dependent upon continued subsidies, this should be considered as likely evidence that it is, in fact, a net energy sink. EROEI studies do have a continued role, but they need to be used with care. How Did I Get Involved in this Whole Discussion? I have been what a person might call a “financial detective” for a long time. I started working for CNA Insurance Group as an actuarial trainee in 1970. This was about the time that inflation started to affect insurance companies. After I had been at CNA only a short time, I was the one who figured out how inflation would affect reserves set by claims adjustors. When my predictions proved to be correct, my supervisors were very surprised; they had never considered the possibility that there would be an impact. I soon moved on to a smaller insurance company, where I reported directly to the president of the company. The position was supposed to report to a lower level in the organization, but the president was shocked at what I had been able to figure out about the company from its financial statements, and decided he wanted me to report to him instead. As a result, I had an opportunity to see the impact of the 1973-1974 oil price spike on an insurance company, from a front-row seat. I also got a chance to see what impact rapidly changing interest rates had on an insurance company. I later went back to CNA, and observed the problems they were also having. I later moved into consulting. I was always the “go-to” person for trying to figure out answers to questions that had never come up before. If someone needed a model for something really weird, they would come to me. I would often develop material for expert witness assignments. When new companies were set up, I would set up models of how they might be expected to behave under various scenarios. I worked a lot with “long tail” business, where claims were reported and paid long after the time an injury occurred. I didn’t get involved with oil limits until 2005, and began writing articles about it in 2006. I was near the age where I could take early retirement, so I left in 2007, with the plan to look into the subject further. Editors at The Oil Drum saw some of my articles, and invited me to write articles for them, under the pen name Gail the Actuary. Not too much later, they asked me to be an editor. I soon found myself corresponding with authors, fixing mistakes in articles, and becoming acquainted with many people in the energy field. One of the articles I wrote fairly early was Peak Oil and the Financial Markets: A Forecast for 2008. In it, I forecast the 2008 financial crash. Prof. Charles Hall (of EROEI fame) saw the post, and invited me to come to Syracuse, New York, and give a presentation at the next Biophysical Economics Conference. I soon met many other researchers, either through the Biophysical Economics community, or through my work at The Oil Drum. I was invited to give many talks, including one in Barcelona, Spain, in 2010, which ultimately led to the publishing of my article Oil Supply Limits and the Continuing Financial Crisis in the journal Energy. All of this further led to my becoming more involved with the research and journal end of the oil limits story. I now get quite a few invitations related to the research end of my work. One of the things that led to conflict between the Peak Oil community and me was that I wasn’t really telling the “Peak Oil” story. I was telling something different. By late 2010, the conflict was sufficiently great that I started writing my articles on OurFiniteWorld.com, and let TheOilDrum.com re-publish the ones they chose to. I continued to be an editor at TheOilDrum.com, however, until its close in 2013. My general approach has been to learn as much as I can, in as many ways as possible. When various groups would want to sponsor conference phone calls, I would always participate, regardless of whether the group was a renewable group or one from the oil industry. I tend to interact with the commenters on my site, and get quite a few ideas from them. I don’t accept donations on my site, but I do accept invitations to give talks when people offer to at least pay my expenses. I also have had quite a few opportunities to visit installations of various types–geothermal as well as oil and gas. My only official affiliation is that I am Director of Energy Economics for the Space Solar Power Institute–an unpaid position. All of this puts me in an odd position. The research community seems to accept me as one of their own. But Richard Heinberg of the Post Carbon Institute can’t understand why my view differs so much from the view that the Post Carbon Institute is trying to sponsor. He refers to me as an “energy writer” and says, “Her critiques of renewables appear to be based almost entirely on literature from fossil fuel and utility companies; she doesn’t seem to cite much data from solar and wind engineers.” I do talk to everyone. But I certainly don’t get my views from literature from fossil fuel and utility companies. I expect that having someone give a different view than PCI’s preferred view is threatening, especially if it is having an adverse impact on donations. This following slide shows a simple grouping of fuels I made based on my perception of which fuels are more or less expensive. Appendix, Figure 1. 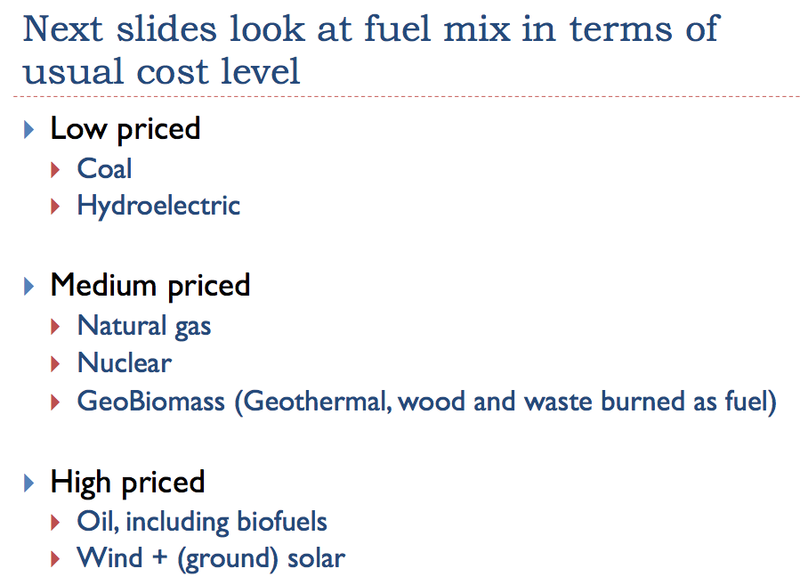 Slide showing groupings of low, medium, and high priced fuels. Growth in energy consumption seems to take place almost entirely in parts of the world that use a disproportionate amount of low-priced fuel. These countries also tend to have low wages, to go with the low fuel costs. Appendix, Figure 2. Note that the scales of the last three slides are all the same. Also note that the last of the four groupings is World Minus US Minus EU. It its thus the remainder of the world grouping. What happens is that the world’s energy mix rebalances away from the countries that use a large share of high-cost fuels in their energy mix. In the end, the low-cost fuels (coal and hydroelectric) hold their own, as a share of total production; countries using a disproportionate share of high-cost fuels tend to lose out in the world marketplace. Once the world “runs out” of cheap fuels to keep adding to the energy mix (or finds the cheap fuels too polluting), the situation changes. The world economy cannot maintain its shift in mix toward products that have a better return relative to their cost simply by rebalancing toward countries with a lower-cost fuel mix. 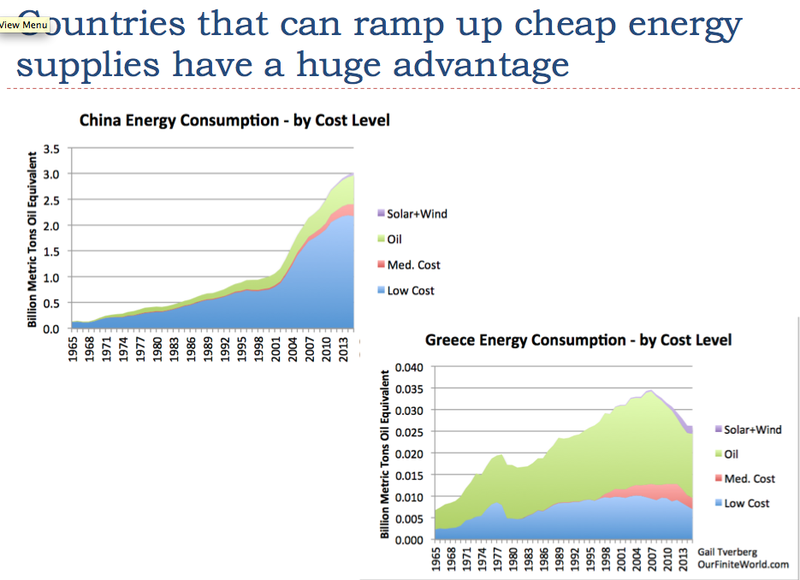 Instead, the price of energy products must fall below the cost of production, to maintain this pattern. We seem to be seeing such a drop in prices below the cost of production, starting in 2014. Proving that this is the reason for the price drop might be difficult, but it certainly is a strong suspicion. ⟵Why it is Better to be a Realist than an Optimist!